SKU: 45-1255 Categories: Pink, Red, Yellow, Green, Dark Blue, Gold, Toot Sweet Harlequin, Napkins, Circus / Carnival, Science, Space / Robots, Big Bang Theory, ON SALE! 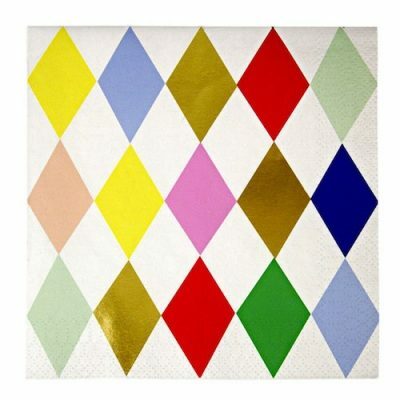 Paper Napkins ~ Toot Sweet Harlequin features the classic diamond harlequin pattern in vibrant colours and finished with gold foil for a luxurious effect. These serviettes can be matched to a range of other party themes and occasions needing bright and bold colours and patterns; they would look amazing at a carnival themed wedding. Also available in this range are the Paper Plates ~ Toot Sweet Harlequin but the also look great with our some of our Toot Sweet Gold items too.